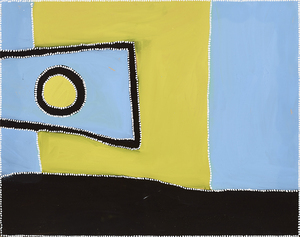 Rammey Ramsey was born in the East Kimberley of Western Australia around 1935. He is a senior Gija man and his Gija name is Warlawoon which is the name for that part of the country where he was born. His father died prior to his birth and his mother died from snake bite when he was a baby. His early life was a traditional nomadic one with family members and later, as a young man, he worked as a stockman at Bedford Downs, Lansdowne and Bow River Stations. During this time his traditional culture was threatened by the social changes that resulted from the growth of the cattle industry. Ramsey has been an artist all his adult life. He has participated in ceremony, made dance poles and practiced body painting. He is a leading member of the East Kimberley painters that started in the early 1980s and joined the Jirrawun Arts Cooperative in 2000 where he continues to pass on traditions and law to future generations through his painting. He is also an acclaimed dancer and actor. Ramsey’s abstract looking paintings are portraits of the traditional lands that he has rights to through birth and family and they are mostly of the magnificent gorges of the northwest. His use of colour is extremely versatile and ranges from subtle shades to combinations of primary colours. The work is characterized by small, minimalist geometric figures on backgrounds of intense colour. Jirrawun closed in 2010 and Ramsey joined the Warmun Art Centre where the custom of painting with ochre pigments collected from the land influenced him to soften the bright colours he achieved with acrylic paint by adding ochre to the paint. His recent work shows strong red colour surrounding symbolic black forms, such as a line for a river or road, a circle for a waterhole, a cave, or a camp, and a rectangle for stock yards or hills. Aborigines think they were created at the beginning of time, a period that Gija people from the eastern Kimberly refer to as Ngarranggarni (Dreaming). As part of this belief, people are created by the Spirit Beings and are as one with this place. Ramsey has recently chosen to paint the Ngarranggarni way by mixing two wet colours on the surface of the canvas to create the strokes and rhythm of the brush. This is a representation of earth, wind, fire and water and evokes the heat and dust, clouds of mist and rain, grass fires of the Kimberley. Ramsey has also collaborated with printmakers at the Charles Darwin University Northern Editions studio to produce richly modulated colour etchings. He has had sell out exhibitions in Melbourne and Darwin and been part of group exhibitions in Melbourne, Sydney and Darwin. In retirement Ramey Ramsey lives at Bow River Station with his wife, children, grandchildren and great grandchildren. His paintings continue to depict the contrasting hardship and beauty of life in the bush.